No one doesn't know the cannoli especially after they appeared in some scenes in Godfather. I watched all three so I was excited when I found out that my Sicilian mother-in-law and her sisters can make them. It was one of the first things that I asked for when I arrived in Italy. 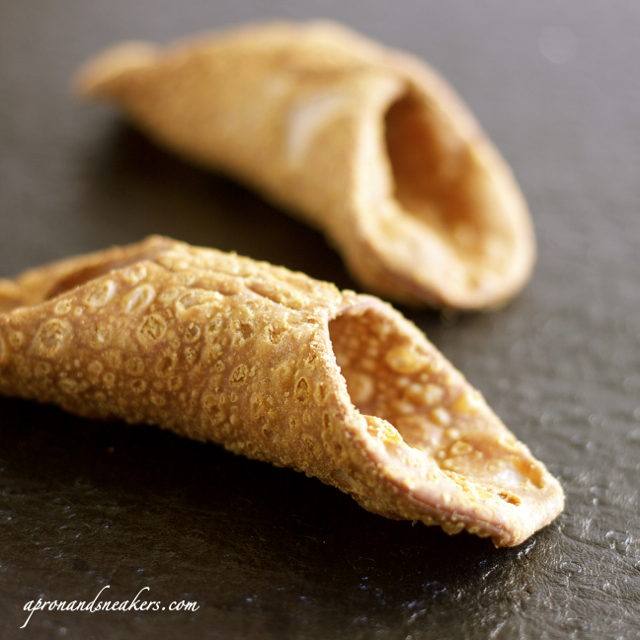 All three sisters used to make the cannoli shells themselves but over the years, there have been very good empty shells from Sicily that can bought in specialty shops in Rome so they also took shortcuts and just made the fillings. After all, it always depends on the quality of the ricotta di pecora (ricotta from ewe's milk) that you use. There are different kinds of ricotta but only this is advised to be used. Advise is a milder version of getting an answer from Sicilians when you ask them which kind of ricotta (there are different types, watch out!) to use. Di pecora! (from ewe's milk!) with a voice a tad higher, surprised look that you even cared to ask and a slight gesticulation of the hands to emphasize it. I get it. Outside Italy, this kind of ricotta should be very hard to find so ricotta made from cow's milk can be substituted but there's always a long debate about it. Cannoli are quite staple in the big family dinners of my husband's side. When everyone is present, they take centerstage when we conclude the dinner. It's the noisiest part of the dinner when you hear praises and fighting for the cannoli. Making the exact number is crucial because a leftover cannolo is a dead cannolo. Sicilians have this certain strictness about fresh cannoli that drives me crazy at times. I struggled with this tight hold on the freshness of the cannoli when I was in Bar Savia in Catania, Sicily with my husband and his cousins a few years ago. It's THE place to get the best cannoli & arancini in the city and everyone from the whole ISLAND knows about it. It does boast of being open since 1897 and it really couldn't have survived all these years if they are not good. I have no words to describe how good their cannoli (and arancini) were. From the first bite to the last crumb, the world evolved just between me and my cannolo. It was phenomenal. And since I wanted to be greedy that day, I thought of taking home a box of my phenomenal find for myself and another box for the directors of my Italian school who originated from Sicily. That gesture of generosity was to compensate for my greediness. I wanted to take home ten of them and I felt slightly guilty and unconscious because there was a queue of people waiting to get them. Some even ordered them in advance. With a low voice, I declared that I wanted ten for take-out while mentally counting how many were left in the well-diminished big tray of cannoli. Twelve. Perfect, I was safe from the clutches of the other two behind me. Here's the funny thing. I was asked when I was planning to serve them. I mistakenly (how should I know?) replied the following morning because I was going home to Rome that afternoon. I was flatly refused. I tried to explain that I wanted to take them to the Sicilians in my school and well, I just want to take them home. Period. Why do I need to explain? And what happened to the rule "The customer is always right?". I was told that the cannoli cannot stay THAT long uneaten. I left the queue with my tail in between my legs. I lost. When a new tray arrived, I trudged back and I declared that I still want to take home ten and my friends and I will be eating them that same night. I am bad in lying and I knew I was reeking of it but I didn't care. I was not getting on my plane without those boxes. The guy packed the cannoli in two boxes with a lot of ice packs carefully placed around each shell. He knew I was lying and he tried to make them stay as fresh as possible for the following day. Admittedly, they were slightly less crunchy the morning after, but everyone was happy, so who cares? 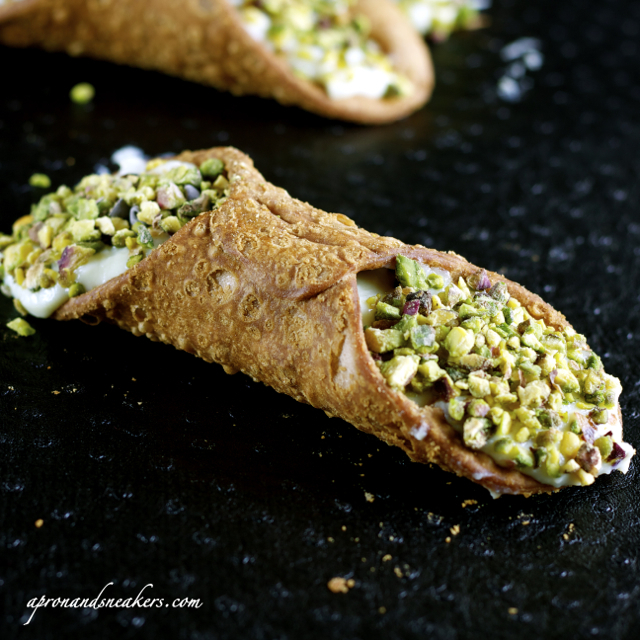 There are some variants of the ricotta filling but my husband and I have always liked the simple one with pistachios. If you want to try making your own shells, refer to this link. If you noticed that the cannoli don't have powdered sugar sprinkled on them, here's a brief explanation why. After taking a LOT of pictures of them, I put away everything. Only the cannoli remained on the table. Then I realized that I forgot to sprinkle the powdered sugar on them. Just as I was thinking about it, the white frame I use for taking the pictures crashed on top of the cannoli. All four of them. That answered my thoughts, they will just have to remain sugarless. In a bowl, mix the ricotta di pecora, sugar (Put half of the amount first then work your way up adjusting to how you want it sweet.) & vanilla powder. Mix well. With the use of a strainer with a fine mesh, put the ricotta mixture in it and push the mixture through with the help of a rubber spatula. Let it fall in a new bowl. This way, the ricotta filling will have a very fine consistency. Add the chocolate chips (if putting). Refrigerate for an hour. 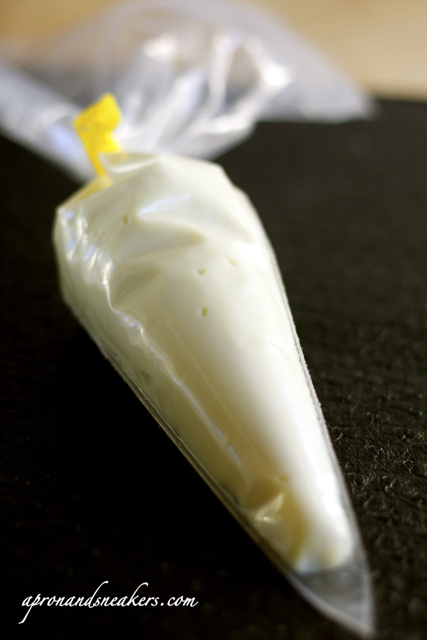 Transfer the ricotta filling in a pastry bag. Fill up the cannoli shells. 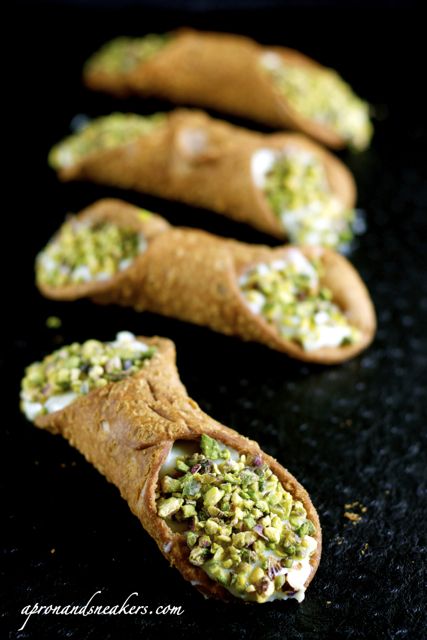 The cannoli shells should only be filled up not more than a couple of hours before serving because the shells can get soft. If you cannot do this, a way is to cover the inside part with melted chocolate, wait for it to dry up then fill up the shells with ricotta. 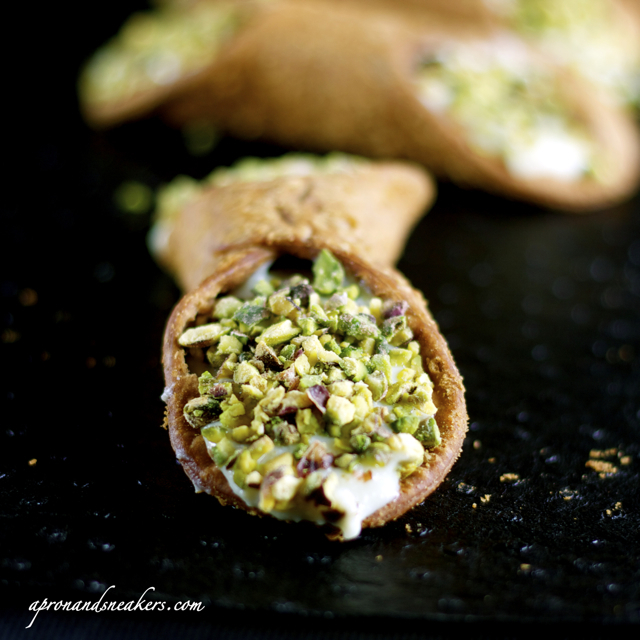 When the cannoli are filled up, cover both ends with chopped pistachios. Sprinkle cannoli with powdered sugar right before serving.